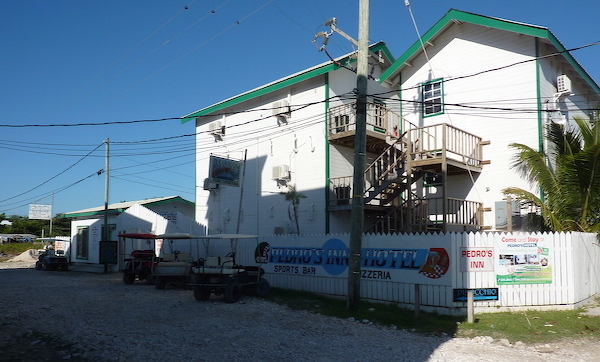 San Pedro town, on the island of Ambergris Caye, is Belize’s version of Cancun. Ambergris Caye was voted Trip Advisor’s Traveler’s Choice “Best Island” the past two years in a row. This is THE hotspot for tourists and has numerous resorts, ranging from budget to luxury and everything in between. If you’re looking for nightlife, you will find it in San Pedro! We flew from Placencia to the Caye and it took us less than 40 minutes. We took a super short taxi ride to Pedro’s Hotel and plopped our bags down in our “deluxe” room. Pedro’s is GREAT! It’s a budget hotel and our giant room with king bed, balcony, and daily maid service set us back only $80 US per night. 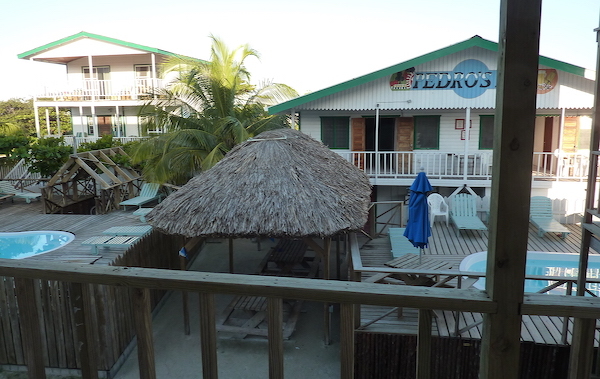 You can stay at Pedro’s for as little as $10 per night in their hostel rooms but you still enjoy all the amenities the property offers like the open air palapa and two swimming pools surrounded by wooden decks full of picnic tables and lounge chairs. You can book tours and excursions through the hotel’s office, rent bikes or a golf cart, and there’s even a popular bar onsite that has live music, trivia nights and truly good pizza. 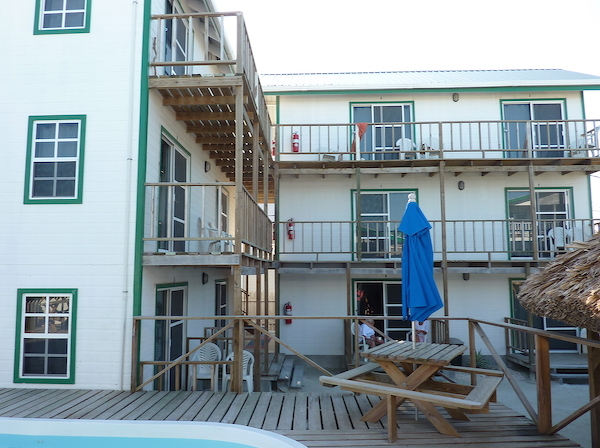 Pedro’s is a really fun place to stay and meet other travelers. Our first afternoon in town we explored the surrounding neighborhood a bit on foot then went to the pool to have a beer before getting ready to go out for the night. “A beer” turned in to several beers and a shot of rum because we met a group of British Military guys that were staying at Pedro’s for a few days during a break in their training. They had a few days off from jungle training down in southern Belize and decided to fly up to San Pedro to have a little fun and blow off some steam. These guys raised hell on the island and sure knew how to party. We couldn’t wait to see them each day and hear about what kind of trouble they found the night before. There were hilarious stories about naked jet skiing, drunk driving their rented golf carts, visiting a brothel, getting robbed, threatening the local drug dealer, and peeing your pants. One guy broke his leg during a night of drinking- he dove off a pier and slipped on the ladder climbing back up. It didn’t spoil his fun for very long though, we saw him out at the bars less than 24 hours later. 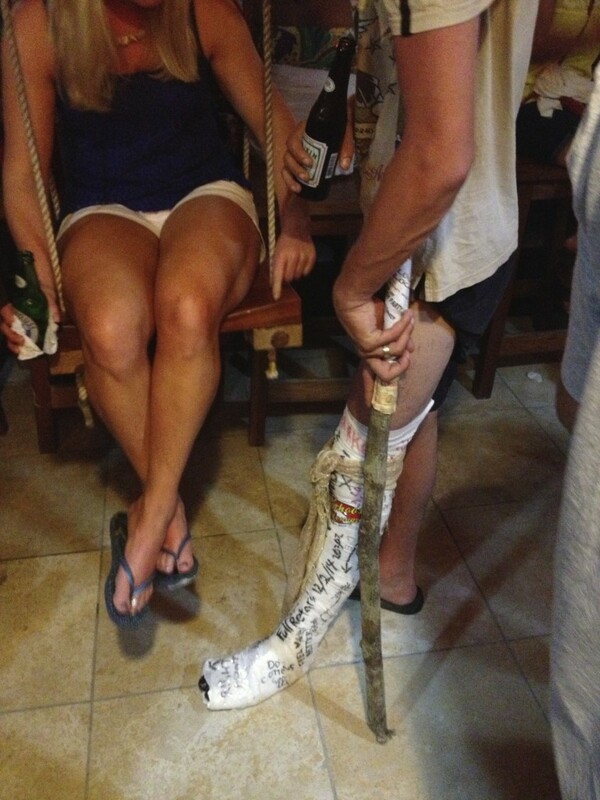 With his makeshift crutch and a Belikin in hand. These guys were insane! Just too outrageously funny. Ever notice that guys with British accents can get away with saying the vilest most disgusting things and it comes across as charmingly hilarious? 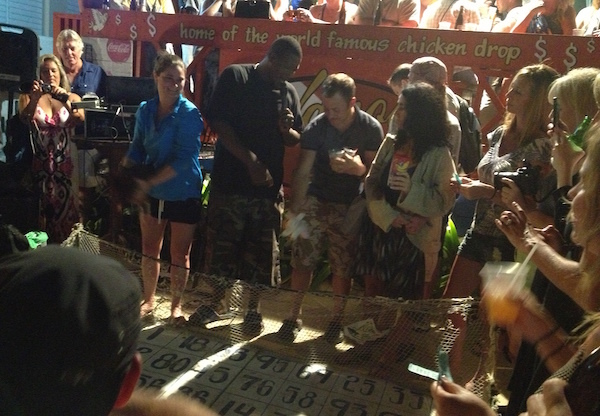 They taught me some new slang and how to pet a chicken in to a trance so you can kill it. Cool! 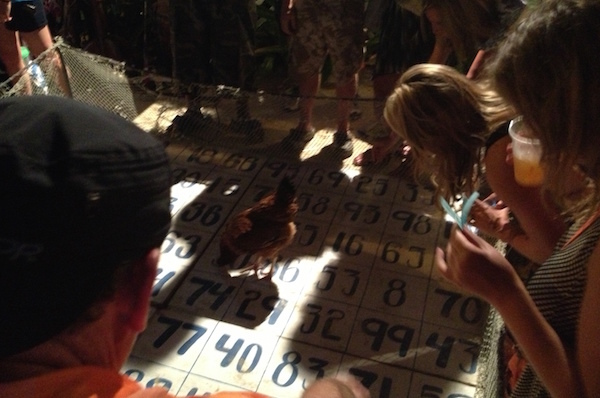 We didn’t kill any chickens that night but we did gamble on where they would poop. Yeaaaa! 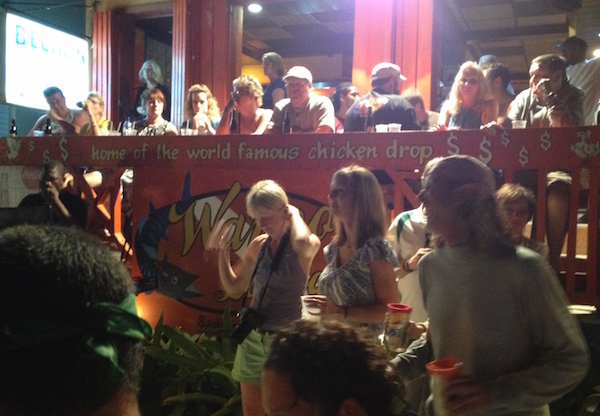 If you’re lucky enough to be in San Pedro on a Thursday night you just HAVE to attend the weekly “Chicken Drop” held at Wahoo’s Lounge on the beach. Yes it’s gimmicky but it’s also an undeniably good time. Get there early to purchase your tickets and be sure to play more than one round. If you’re lucky you might just be chosen by chicken security to prep the chicken for its poop by gently shaking it then blowing on its tail feather.